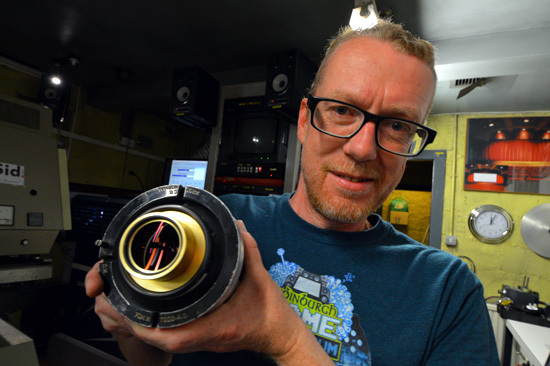 Filmhouse's Chief Technician David Boyd with one of his lenses for 70mm projection. Edinburgh Castle rises majestically high above the city and can be seen from almost any place in the old capital of Scotland. "This is Cinerama" was photographed partially at the castle in 1952. Edinburg was "blessed" with plenty of 70mm cinemas many years ago, but I don't think there ever was a 3-strip cinema in this city. Across the castle park in Edinburgh's West End, is Lothian Road. In number 88 you will find the Filmhouse cinema - the only remaining 70mm cinema in the Scottish capital. Three screens located in a former church. All screens are fully digital-capable, as well as all screens being still equipped with Philips and Kinoton film projector equipment. Screen One even with the classic Philips DP70 Todd-AO 70mm projector. Screen Two with Philips DP75s, and Screen Three with a Kinoton FP38 (35mm/16mm combo) and an FP30. Some months ago I wrote an e-mail to the Chief Technician David Boyd saying I would be in Edinburgh on vacation, and if possible I'd like to come and visit him, and see his DP70s. David was quick to respond and said I would be very welcome indeed. I arrived on a Thursday morning around 10:45 in the last week of July, and David was there to give me the big tour. The Filmhouse has already been described in detail by David in 2009, so I will stick to my own visit. It was great to see the DP70s in David's projection room. David explained how he has rebuilt them to run any film speed required. He has even managed to buy Kinoton's last intermittent system they had in store. His projection rooms were very well organized, with everything labelled beautifully. Most things are run digitally these days, but all film projectors are kept in full working status should a 35mm or even a 70mm print arrive on the film schedule. Wide angle image of Filmhouse, screen #1 with 70mm installed. Throw 18m. Fixed height 3.5m and width for 70mm at 2.20:1 ratio is 7.7m - for "H8" Filmhouse will need to letterbox! Seating capacity is 280. The cinemas are built inside an old church, so there are many stairs and hallways to pass through to get from screen to screen. To be honest, I completely lost my sense of direction, when David guided me from cinema to cinema. I took plenty of pictures as we went around. They are not very big cinemas, nor are the screens very large or curved given the physical limitations of being inside a location not designed to be a cinema. David told me he's heard about some directors complain if a screen is curved. "Why are you distorting my film?". It's debateable. Personally, I think a screen should be curved - the world around us is curved. They run the Filmhouse with great care and love for the cinema, however, and show more film titles than any other cinema in Edinburgh. What is lacking in big screens is easily compensated for with plenty of charm and classic cinema atmosphere instead. Something the local VUE megaplex cinema certainly does not have, nor will ever get. We concluded the tour in Screen One, and David set the curtains and masking for 70mm so I could take some pictures. He hoped the Filmhouse will be able to show "The Hateful Eight" in Ultra Panavision 70 early in 2016 should 70mm prints be made available. 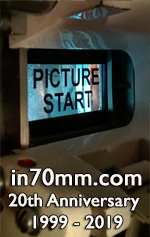 Although he would have to mask the screen to "70mm letterbox" to accommodate the wide image. 90 minutes later our tour was completed upstairs in the main projection room. David showed me the 110mm lenses for 70mm projection. Properly kept in a dust free cabinet, and I finished my cup of tea. A very nice and informative tour had come to an end, and David and I said goodbye in the foyer. Time to rejoin my family who was touring the castle.